Most astronauts dream of having the opportunity to perform a spacewalk at least once in their career and I am no exception to that rule. There’s something appealing about the idea of leaving behind the relative safety of the Space Station wearing your own little spaceship, about the thought of driving bolts while oceans and continents majestically pass by, about the challenge presented by the most physically and mentally demanding activity ISS crewmembers are confronted with. 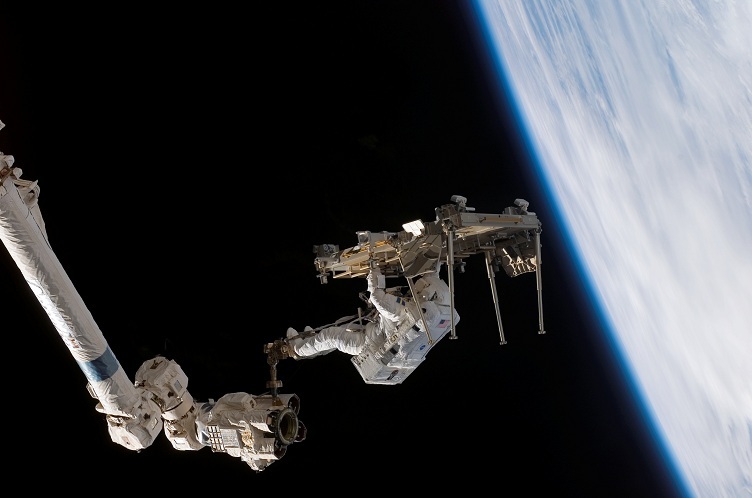 There are also specific risks inherent to a spacewalk and one of the most dreaded scenarios involves a spacewalker going unconscious due to a medical issue or a malfunction of the pressurized suit. Over 150 spacewalks have been performed to assemble the Space Station and such a dramatic scenario has never occurred. However, you will not be surprised to hear that it does materialize quite often during training in the Neutral Buoyancy Laboratory (NBL). 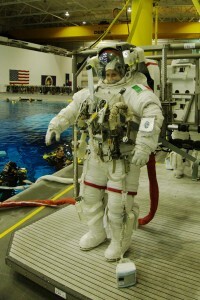 During the EVA training flow future crewmembers are required to demonstrate the ability to rescue an unconscious fellow spacewalker by bringing him or her safely back into the airlock within 30 minutes. 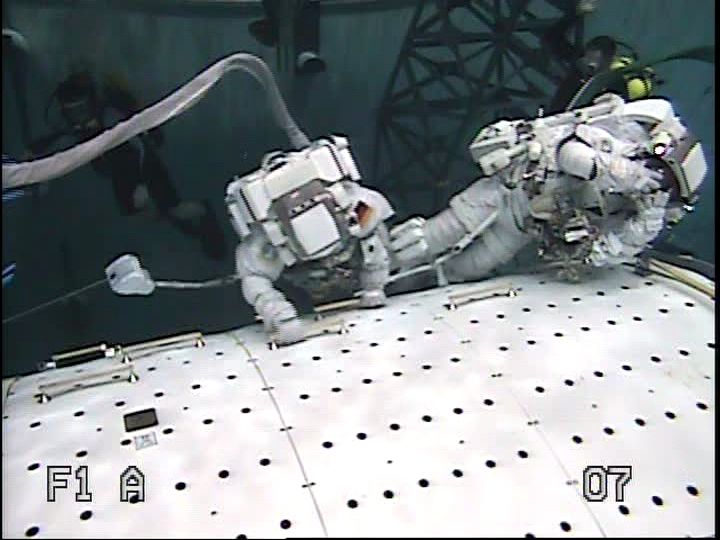 I had a chance to try the rescue for the first time last Thursday during a six-hour run in the NBL with veteran spacewalker Steven Swanson (Swanny). Ready to be lowered into the water for an NBL training run. Notice lying on the floor the reel of an 85-foot safety tether. The big hook attached in front is connected to structure after airlock egress, while the reel follows along. This being my first attempt at the rescue, the scenario was extremely simple. I knew in advance that Swanny was going to simulate unconsciousness and I was right next to him on the truss. Also, neither of us was carrying anything at that point, and we were both attached to structure only with our respective safety tethers and one extra tether. We call this latter the local tether, since we attach it locally at a worksit to be able to work with both hands. Safety tethers, on the other hand, are thin steel cables that are coiled in a reel. We attach one end to structure as soon as we exit the airlock, and since we carry the reel with us, the cable uncoils as we move away and recoils when we come back. If we need to go far out on the truss, we might even have to carry a second safety tether to attach when the first one runs out, and having to make the swap on the way back with an unconscious crewmate would require extra precious time. But it was not the case for me on my first try. I merely had to detach Swanny’s local tether and use it secure him to myself, and then stow his safety tether, since we would be both secured by mine. Sounds quick and easy, right? Well, I guess it could have been. In reality, when I was ready to move, I realized that I had created a tether tangle and I would have to take the time to fix it if I was going to go anywhere. Good lesson learned! Nothing in the suit is easy, but the rescue seems to be in a category of its own. It’s quite a challenge to manage the bulky suit of the unconscious crewmate by pushing or pulling it on a tether, while at the same time making sure that it doesn’t bump into structure, especially not with the relatively fragile visor. And it’s quite a challenge to manoeuvre him or her into the airlock in an expedient manner, and to enter as second without the colleague helping, or at least getting out of the way. I was sure thankful to Swanny for showing me some veteran’s tricks to do that! I’d must test with you here. Which is not something I often do! I take pleasure in studying a submit that will make people think. Also, thanks for permitting me to remark! It migh be weird to say it, but this definitely makes me dream! Well, of course not the fainting part, as fake as it was, but the EVA rescue training one… a thing I wish I can try one day (as far as it is an exercise… don’t know if I would be that happy if it actually happens in space…)! This sounds so challenging – how often do you train physically during a week to be able to keep up with having to do such strenuous tasks?! Is there any way to perform medical procedures on crewmembers during space walks before you get to the airlock?